Can the Magicians tap into the magic of the thriving eSports Industry? Memphis, TN–There’s a new game being played down in Soulsville. 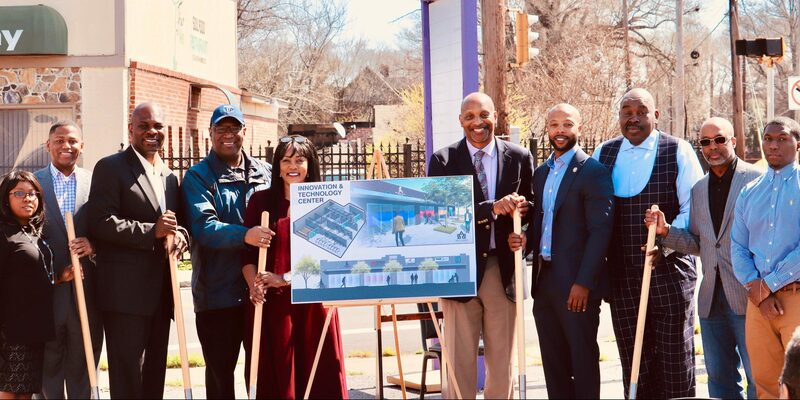 This past Saturday the LeMoyne-Owen College Community Development Corporation along with BraveDog Games® broke ground on the BraveDog Innovation Center. From the outside looking in the innovation center may appear to be a place where kids from LOC and the community are playing video games all day. That wouldn’t be entirely false but there are more layers to this project than just joysticks and graphics. The center will feature a premium video game lounge along with a start-of-the-art eSports arena but there are business and commerce components as well. The plan calls for an eSports academy, merchandise retail store, student video game development training facility, private investors ideation pitch room, entrepreneurial training center, workspace, and a financial literacy center. So this isn’t your father’s era of hopelessly blowing into the cartridge so you can save the princess on Mario Brothers. The business of eSports has taken America, and the world, by storm. According to a market report released in February by gaming research firm Newzoo, the global eSports economy is expected to top $1 Billion for the first time in history. According to the report that’s a 26 percent jump from the previous year. That’s just for eSports and the ecosystem that surrounds the community of competitive gaming. A bulk of that economy comes from media rights, advertising, and sponsorship. Competitive gaming has become such a thing in the last few years that Wall Street giant Goldman Sachs is following the industry’s growth. The firm has predicted that by 2022, the audience for esports will grow to 276 million people. Technology consulting firm Activate suggests that by 2020, 70 million people will watch a single eSports final. That number is higher than the viewership for U.S. professional baseball, soccer, and hockey finals. On the consumer side, customers in the United States generated $43.4 Billion in revenue in 2018 according to a study by the NPD group. The potential of the eSports market has drawn investors from all over including professional athletes and entertainers. Recognizable names like Michael Jordan, Drake, Stephen Curry, Kevin Durant, and Jennifer Lopez have all invested heavily in the sport. With the context of those numbers in mind, the center is expected to generate a lot of fun but it’s more than just a game. On the micro level, the center is projected to generate $15 million in economic growth in the South Memphis and Downtown areas. On the macro level, the partnership with the LeMoyne-Owen College CDC can prepare people for a career in the video gaming industry. Soulsville community for nearly 20 years, I’ve never seen a project with this much potential to impact both the people and property of our community. We see this effort as an opportunity to develop the next “big thing” in gaming in the heart of one of the poorer census tracts in Memphis,” said Michael Q. Minor, board chair of the LeMoyne-Owen College CDC. One of the central figures bringing the forward-thinking project to this HBCU community is South Carolina State alum, Isiah Reese. He is a former football player for the Bulldogs who has gone on to have huge success in corporate America. In the past Reese has worked for Microsoft, Walt Disney, Coca-Cola as well as others. chief executive officer of BraveDog Games. Reese is also a current board member of BraveDog Games. “It is no secret that technology has been transforming many different industries. Today’s economy demands a workforce that has creative and innovative risk-takers and critical thinkers in the 21st century,” Reese said. “Our community youth are looking for opportunities to excel in life other than being a professional athlete or resorting to less than desirable activities. This project will give them that opportunity. With the existing momentum in our community, this project will be a catalyst for additional development,” added Minor.